When John Key joined investment bank Merrill Lynch in 1995 he was soon commuting between London and New York. 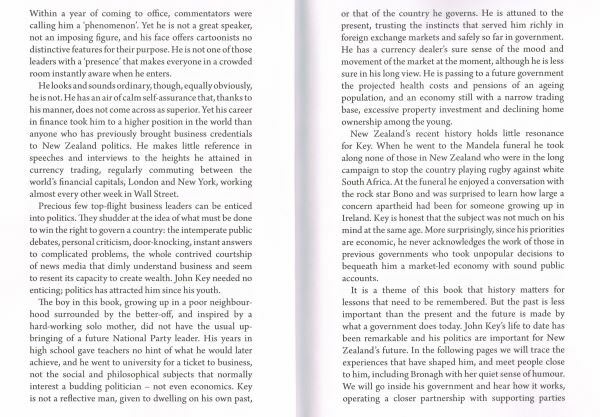 In this extract from John Roughan's biography, John Key, Portrait of a Prime Minister, he describes how he made his fortune. Merrill Lynch was in essence a massive stockbroking firm with about 15,000 rich private clients. Through a network of advisers, each with about 100 clients, the firm could find investors for any financial asset. "If you were IBM and you wanted to issue commercial paper or bonds or stock you virtually had to deal with Merrill Lynch. But in foreign exchange we used to go to other banks, almost like a customer. "So in London I said, look, we have all these customers doing all their trading with us in bonds and equities and everything else, but they are not doing foreign exchange with us. What we can do is build a liquidity distribution and go to these clients and say, we are not asking you to do anything at extra cost to you, we are asking you to do your foreign exchange through us." He took his proposal to the other big Wall St investment houses such as Morgan Stanley and Goldman Sachs. 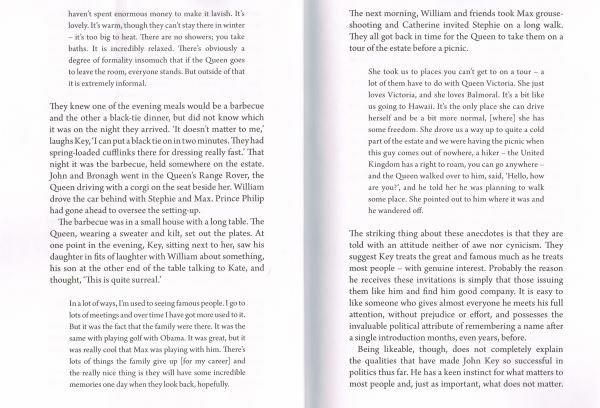 "I went out to lunch with guys from Goldman's and said, I'm going to go interbanking, you guys should come with me. The investment banks can go in there and beat them all. They said, you're mad. I said, you're mad, you're in the dark ages. "In the end business flowed into us because we had all these cross-collateral agreements. We were cross-selling several products off one bit of margin. We could go to big hedge funds and say, give us a billion dollars and we will let you buy bonds, stocks, equities, we'll revalue everything." Soon the other investment houses followed Merrill's lead. With so much going on in New York it must have been tempting to move there. But Bronagh, Key's wife, and their two children had settled in the London suburb of Barnes in a house they liked. Key became a frequent transatlantic commuter, often taking the 6.40pm flight out of Heathrow on a Monday night after a day's work in London, arriving in New York around 1.30am, going to a hotel, taking sleeping tablets "or you just couldn't do it", then waking in time to do a day's work there on Tuesday. He would sometimes stay three days in New York then repeat the overnight commute, taking a Thursday night flight from JFK, landing at Heathrow at 6am, showering and shaving and working Friday in London. There were periods when he made the trip three times in 10 days, other times he would not need to do it for three weeks or a month, but it averaged out that he was on Wall St about every second week. No wonder his weekends were quieter than the excesses of the financial trading stereotype, though Key saw plenty of that. "There were guys working for me ... On Mondays they'd say, how was your weekend, and I'd say, oh great, we took the kids to a duck pond, Saturday night we went out for dinner, what did you do? They'd go, I took the Brazilian lap dancer over to the US on Concorde and had a bit of fun." Bronagh recalls friends who would go to a resort in the middle of the Indian Ocean where they worked out they were spending US$1 a second while they were there - "why would you?" "It was just stupid," agrees John. "Guys that worked for me had jets and just blew their money. Lots of people around us were doing that. In the end they came away with no money and they had been earning around the same levels as me." Key will not divulge how much he did earn at Merrill Lynch but will give a good hint. When he came home, after six or seven years at the top of international currency trading, the National Business Review put him on its rich list with an estimated personal wealth of $50 million. "They are just guessing," he says. Maybe, but when it is suggested that $50 million seems a little high for someone on salary and bonuses for that time, he explains that not long before he joined Merrill Lynch in 1995 its remuneration packages had been typically cash, stock and stock options in a ratio of 40:40:20. "When they came to me at the end of 1995 I said, I don't want cash, pay me 100 per cent in stock and options. I was convinced the stock was undervalued. So they paid me a bit of cash but not much. The proportion of stock was much higher and in the years I was there it went up seven times. You can do the maths. If it was a $2 million [annual] package it ended up being $11 million. So even if I paid $4 million in tax, I was doing alright." By the time he left the firm at the end of 2001 he would have been paid in Merrill Lynch's appreciating stock for nearly seven years. That figure of $50 million for his personal wealth was probably close to the mark. While Key is in politics it sits in a blind trust. His lawyer chose the trust managers. Key does not know them. He gave them a mandate to invest conservatively (lower risk and returns). "I want to be able to look down the camera 100 per cent and say, 'I don't have a clue what I own'." John and Bronagh had left New Zealand intending to be away only a couple of years. They did not sell their newly built house in Remuera until it was clear they were going to be away much longer and, even then, they had their eye on a new property in Auckland. Ever since she had come to live in the city Bronagh had loved Parnell. The old inner city suburb with its quaint shops, art galleries, boutiques and fine restaurants was no longer the most fashionable real estate in Auckland. It had been eclipsed somewhat by the gentrification of equally old Freemans Bay, Ponsonby and Herne Bay on the western side of the inner city. But to a newcomer to Auckland there was, and is, no contest. Driving around Parnell, Bronagh used to look longingly at a spare section beside an old house in St Stephens Ave. She often said when they passed, "I'd like to live there." They had been in London a couple of years when John made a quick trip home to visit his mother and a friend in Auckland phoned to tell him "Bronagh's section" was for sale. He went there, saw that the house and section were on the market and phoned the agent. "He came around and said it's on for, let's say, $2.7 million. I offered him $2.4. He said that was what it previously sold for and told me there was a guy willing to pay the asking price but hadn't yet fronted with the money. I said, here's the deal: it's $2.4 million cash and you've got 15 minutes. I'm flying out shortly. "He started to play games. I said, it's 13 minutes, take it or leave it. He said, well there's this other guy ... I said, there's always another guy, you've got 11 minutes. "So, anyway, he took it. I signed the papers at the airport. Then, when the plane landed at Singapore, the agent was on the phone offering us more than we had paid to walk away from it. Turned out there was another guy, who hadn't believed we existed, and he was offering $100,000 more than we'd paid. The agent said, would we sell? I said, nah." It is a story that Key could use to illustrate a theory of why some people get rich and the majority do not. Most people, he explains, take their profits too early and cut their losses too late. If they buy a house for $500,000 and a month later somebody offers them $600,000, it is human nature to take the money and dine out on their good fortune. Conversely, if they put that $500,000 house on the market and the best offer it brought was $350,000, they would hold onto it. A good dealer would not. As soon as he realised the asset was losing value he would get what he could for it and put the money into a new, hopefully better, investment. At Merrill Lynch Key used "profitability profiles" for each of his traders showing the days they had made money and the days they had lost it. Some who made money most days never made enough to make up for their big losses on other days. "They got out too soon on good days and never cut their losses quickly enough on the others." He was a manager more than a trader in his years at Merrill Lynch though there were days when he would sit down in the dealing room and quote prices, "just to keep my hand in, show them how it's done". To do it well, he needed complete confidence in his instincts. "I used to be able to sit there and look at two digits and tell whether the price was going up or down." At the dawn of 2001, the year he would turn 40, John Key decided it was time to think about starting on the second big ambition of his life. 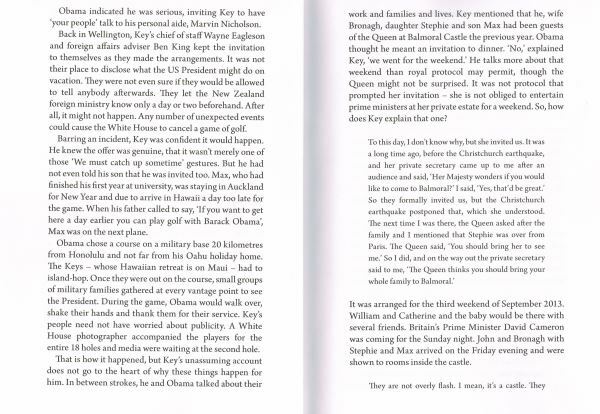 Key went to New York to tell the head of the investment bank, G. Kelly Martin, he was leaving. Martin offered him the position of global head of sales, in charge of the whole debt business side of Merrill Lynch. Key seriously considered it. If he took the post, which would mean moving to New York, he knew his political ambitions in New Zealand would be buried. "I wouldn't have come back." By then he was on the boards of a number of Merrill Lynch subsidiaries in Europe, including the board of its Capital Markets Bank set up in Ireland. He had transferred much of Merrill's London business to Dublin to take advantage of Ireland's low corporate tax rates. He was also doing an e-commerce project for the company in association with Harvard University. Currency trading margins were being squeezed by new information technology that let clients see the market as clearly as dealers could. Key believes the narrowing of margins contributed to the global financial crisis as dealing houses tried to maintain their profitability. They compensated for the reduced margins by increasing their volumes exponentially and relying on leveraged accounts like hedge funds with $1 billion on which they were trading $50 billion. When he visited the firm in later years he was astonished at the risks it was carrying. Merrill Lynch was the third of the big five Wall St investment banks that could not sustain its losses after the subprime mortgage collapse and, in September 2008, it was bought by Bank of America. Had Key stayed at Merrill Lynch he would have been, according to a former boss, Gavin Walker, "without doubt a candidate to be their global chief executive. He was in that echelon just below". But Key had made up his mind to go. He had made about 50 times the million dollars of his childhood ambition. The Keys returned to build a $5 million mansion in St Stephens Ave - "the house that Merrill built", John would call it. They had a beach house at Omaha north of Auckland, they kept their London house and they bought a Hawaiian holiday home for a reported US$3.2 million in the exclusive Wailea resort on Maui. More than 12 years after quitting the financial world , the Keys remain content. Says John: "We are not ridiculously wealthy. There are a lot of people with more. The Graeme Harts of this world. There are lot of people never seen on the [NBR] rich list who have lots of money. We are not in that category." Bronagh adds: "I think it is fair to say we are conservative with money. We have a nice home and nice holidays. We don't want for things but we're not silly either." Sitting in that "nice home", John agrees. "Yes, we built a big house but this house is now worth substantially more than when we built it. It has been a good asset. We just don't have an expensive lifestyle really. We eat well and drink nice wine but don't feel the need to drink Chateau du Pape. If we go to LA we fly business class because it's a long flight." "The kids fly economy," interjects Bronagh. "They want to," says John. "Well, we tell them they are flying economy," Bronagh counters, "and they are now at that age that it really is not cool to be in business class with your parents." Why, though, with the financial world at his feet, did John Key make the decision to come back? "Well, three things. First: in our hearts we wanted to live in New Zealand. Stephie was 8, Max 6. Max had never lived in New Zealand and Stephie had spent most of her life away. Secondly: I absolutely wanted to do it [politics]. I used to say to people, I didn't want to die wondering. I didn't want to sit back one day and think, I could've, might've, should've. "Third: We had enough money. Okay, we could have made tens of millions more, but we had enough."